In PvP mode, players can be on different forces. Each force can have one (free-for-all) or more players (teams). Each force has its own independent research progression. Additionally, each force's turrets and combat robots will attack other players as enemies, unless a cease fire is set. Note that, depending on the scenario, cease fires may be unidirectional — setting a cease fire with an opposing force does not guarantee a cease fire from them in return. Players can draw power from an opposing force's electric network, by building structures inside the coverage area of a power pole belonging to an opposing force. Power poles that you build next to a power pole belonging to an opposing force will automatically connect to it, but will be impossible to connect or disconnect manually. 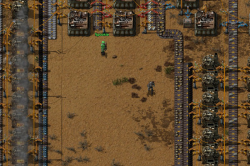 Factorio can run as a dedicated server without graphics. DNS names can be used when connecting to multiplayer game. Smaller multiplayer heartbeat packet size.